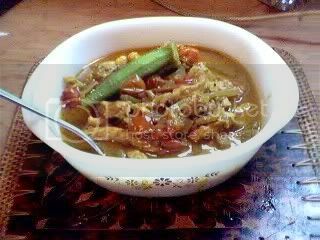 This is my version of curried pork, which I cooked when the girls and I had a taste for a stir fried dish with plenty of vegetables. I had to cook a meat dish for my husband, who had to have meat with every meal. Not the small amount of meat in stir fried dishes, but a real meat dish, where you can see pieces of meat. I had a side of pork loin roast where I removed a couple of slices for my stir fried vegetable dish (recipe to follow) the rest, about a pounds worth, I sliced up for this recipe. By the way, the lone okra on top, is the first from my garden. I only had one as the rest haven’t matured yet, so I just threw the okra in the pot during the last five minutes of cooking. No, with all the jalapeno peppers in this dish, this is not for the kids, although Jade did have a taste of it. Heat the vegetable oil in a pot and add the curry powder. Stir until fragrant, and add garlic and onions. Cook until onions are translucent and garlic is fragrant, then add the tomatoes and jalapeno peppers. Cook for a minute and add the sliced pork meat. Season with oyster sauce, then add the coconut milk and simmer until the meat is tender. Since I used a tender cut of meat, it didn’t take but about 30 minutes of simmering. Add salt and pepper to taste, and add the basil leaves during the last ten minutes of cooking. Obachan, I’m glad it turned out well for you. Please do show us how your version turned out. I don’t mind the link at all! Thank you! I made this curried pork today and it was pretty good! 🙂 I’m going to post the result to my blog with a link to your site. Hope it’s OK with you. Obachan, thanks for visiting our site, too. I didn’t use a recipe for this dish, I just improvised with what I had. It was pretty spicy, but very good, if you like spicy. Thanks for visiting my blog the other day. I really think I outa try this curried pork….this may go well with my “banana rice” still left in the freezer. In the area where I live now, okura and tomatoes are local specialties (sort of). I always feel happy when I find recipes that use these vegetables.